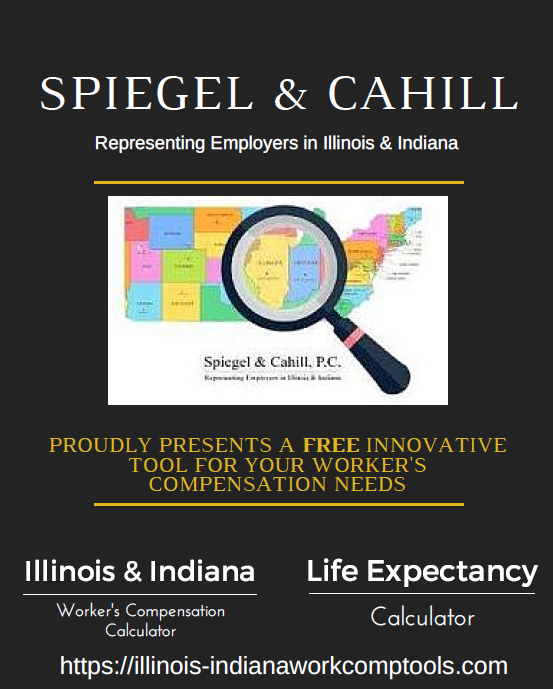 Spiegel & Cahill, P.C., represents businesses and insurance companies in Illinois and Indiana with Workers’ Compensation Defense, Subrogation Recovery, Appellate Practice, and Medicare Set-Aside Services. Our workers’ compensation defense attorneys work tirelessly to defend businesses and insurance companies against undue liability and exposure associated with workplace injuries. Spiegel & Cahill, P.C., represents clients throughout Illinois and Indiana. Our attorneys have extensive experience in the defense of Workers’ Compensation cases. Our decades of experience in this highly specialized field enables clients to make informed decisions when faced with a workers’ compensation claim. We understand the importance of working with our clients to contain litigation costs and, when appropriate, pursue alternatives to litigation. We utilize appropriate technologies to increase our productivity and responsiveness, while managing costs. A paperless system is already in place for those clients who prefer this method. Through our many seminars and publications we educate our clients and others on subjects in which we have a particular expertise. With a reputation earned by experience and comprehensive knowledge of workers’ compensation law, Spiegel & Cahill, P.C. provides assertive representation to employers and insurance companies. Communication is the cornerstone of our practice, we have not only the technology but the commitment to be responsive to our client’s needs.